Based on our *new* 24V diaphragm pump, capable of running up to 10 nozzles. This misting system is virtually silent. Pump can run dry with no damage !!! Our nozzles are equipped with a check-valve which greatly reduces the drip after misting is done. This was already a great improvement that set us apart from other vendors. Pump is adapted for 1/4" push in fittings and carries 2 year warranty. This pump can silently run 1 nozzle or as many as 10 nozzles. We do not ship reservoir buckets with our kits. No need to add to the shipping cost for something that can be picked up locally for a few dollars. Our misting systems come with instructions and push in bulkhead fitting to convert any bucket or container into a reservoir. Plastic pails cost from $3-$8 retail depending on size. 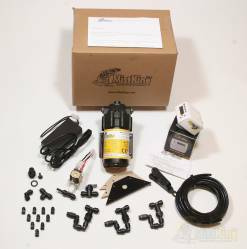 This kit is based on our our Value Misting Assemblies. Robust and stylish nozzles. These nozzles are loaded with features! Pump is adapted for 1/4" push in fittings and carries 2 year warranty. This pump can silently run 1 nozzle or as many as 20 nozzles. Our misting systems have been applied in a multitude of applications, from patio cooling, reptile, amphibian terrarium/vivarium enclosures, growing shelves with orchids or exotic plants, hobby greenhouses, and even grocery and industrial applications. Major ZOOs, botanical gardens, educational institutions, corporations and individual hobbyist all recognized our dedication to quality and customer service and are using our systems throughout the world. The wait is over! This is the best and most economical misting system timer out there. This timer addresses all of the timer caveats and limitations of current hardware store digital timers. Until now, there was no timer that could be this flexible. If you're misting an animal enclosure, You now have the freedom and total control. Mist for few seconds in the morning to rehydrate the environment. Mist for few minutes in the after noon to mimic natural weather patterns. If you're currently using a 'hardware store' digital timer with a 1 min minimum cycle time, then consider upgrading. Screen wedge made out of black acrylic. Precision cut to perfect 90 degrees, ideal for mounting adjustable nozzles in screen vivarium tops (ie. chameleon enclosures). Protected by a peel-able adhesive label. 4 mounting holes drilled on the sides and one hole drilled in the middle for the misting assembly. Available for premium and value misting assemblies. See the Installation Instructions for the wedge in a ZooMed vivarium screen top.